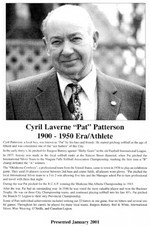 Cyril Patterson, a local boy, was known as "Pat" by his fans and friends. He started pitching softball at the age of fifteen and was considered one of the "ace hurlers" of this City. In the early Thirty's, he pitched for Burgess Battery against "Shifty Gears" in the old fastball International League. In 1937, history was made in the local softball ranks at the Simcoe Street diamond, when Pat pitched the International Silver Team to the Niagara Falls Softball Association Championship, marking the first time a "B" champ defeated "A" winners. The "Oklahoma Cowboys" a professional team from the United States, came to town in 1938 to play an exhibition game. They used 10 players (a rover between 2nd base and centre field), all players wore gloves. Pat pitched the local International Silver Team to a 3 to 2 win allowing five hits and the manager asked Pat to turn professional and travel with them that night. During the war Pat pitched for the R.C.A.F winning the Medicine Hat Alberta Championship in 1943. After the War, Pat had an outstanding year. In 1946 he was voted the most valuable player and won the Buckner Trophy. He was on three City Championship teams, and continued to play softball into his late 40's. Pat pitched the Branch 51 Legion to their only Provincial Championship. Some of Pat's individual achievements included striking out 22 batters in one game, four no hitters and several one hit games. Throughout his career, he played for many local teams, Burgess Battery, Red & White, International Silver, Wire Weaving, O'Neills, and Canadian Legion.